Boston, MA (Jan. 24, 2019) – Insurance IT organizations and those who run them face numerous challenges, including the need for IT resource capacity and specialized skills. It’s no surprise that most insurer IT groups use a “blended staffing” model that combines internal staff with external resources. According to research and advisory firm Novarica’s Insurer IT Budgets and Projects 2019 report, 30% of insurers are planning to increase their use of blended staffing in 2019. 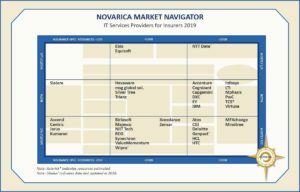 The new Novarica Market Navigator report, IT Services Providers for Insurers, profiles 41 IT services providers in this space to help North American insurers understand and compare their options. 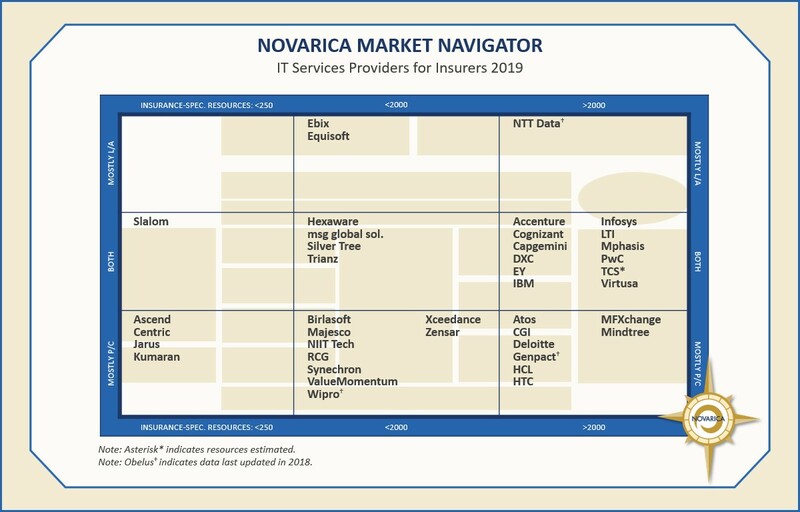 This report provides an overview of 41 major IT services providers for North American insurers, with a focus on their experience levels in key functional areas. The information in this report was collected directly from the providers using a proprietary Novarica RFI. The report contains a brief profile of each vendor, including a chart detailing the provider’s experience levels in specific, targeted functions. Providers profiled include: Accenture, Ascend, Atos, Birlasoft, Capgemini, Centric, CGI, Cognizant, Deloitte, DXC, Ebix, Equisoft, EY, Genpact, HCL, Hexaware, HTC, IBM, Infosys, Jarus, Kumaran, LTI, Majesco, MFXchange, Mindtree, Mphasis, msg, NIIT, NTT Data, PwC, RCG, Silver Tree, Slalom, Synechron, TCS, Trianz, ValueMomentum, Virtusa, Wipro, Xceedance, and Zensar Technologies.